Posted by judylobo in Movie Reviews, Politics, This 'n That. NYC is quiet early on the weekends. Most everyone is sleeping in or out of town. So while walking my dog Benny to Petco around 9AM Saturday morning I spot a very handsome man exiting Zaro’s bakery. Is it Derek Jeter? Does he, like David Wright, the Mets ball player and all around cute one, live around the corner from me? 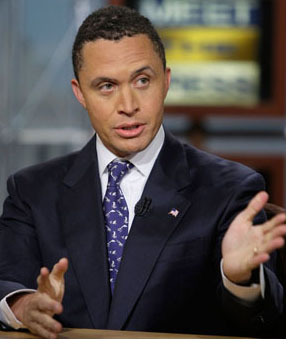 The I realized – it was Harold Ford, Jr. He’s the man that moved from Tennessee three years ago after losing his Senate race and has quietly begun to stir the pot here in the Big Apple. He appears regularly on MSNBC as a talking head. I mentioned him awhile back as the guy who has the chutzpah to challenge Kirsten Gillibrand in the upcoming Democratic primary. He was on his cellphone speaking to someone about an upcoming interview, I was going to interrupt him and tell him to ‘go for it’ but Benny had to sniff a very pungent fire hydrant and I missed my chance. Ford wrote an op/ed piece in the NY Times today. I am not sure what his real agenda is – but stay tuned – the NYC Primary is going to be very interesting. Andrew Cuomo is going to throw his big hat into the Democratic Primary for Governor this week too. – The PS on my jury duty experience last week. I was disqualified from one jury for being too opinionated. Moi? We were all excused mid-day on the second day and thanked for our service. We were told that we would not be called for any State jury duty for the next six years. However- if the Feds call us for jury duty – well, good luck. So, it is anyone’s guess who will be called for the upcoming terrorist trials (if they ever happen). Can you imagine that jury pool? Posted by judylobo in Photography, This 'n That, Videos. Today is my birthday. It is a very LARGE numbered birthday (in my hometown of Brooklyn we would say it was YOOGE). I normally do not give a hoot about age but this one hit me like an asteroid. Why is that? Because I am now, by all of the accepted standards, officially old. After dwelling on this BIG number I have decided there are good things and bad things about being 65. Here are a few of those things. – The Government thinks I am old and gave me a Medicare card. The good thing is that my health insurance dropped from a whopping $900 per month to about $400 a month. I do not know if the supplemental coverage that I had to buy includes an appointment with the death panel. I will keep you posted on that one. The funniest thing about getting all of the literature from Medicare is that it is printed in a very LARGE font so instead of a brochure that would normally be 12 pages – it is actually about 24 pages. – The MTA also considers me old and now have one of those half fare cards. This is good thing. Instead of $2.25 per ride on the subway – it is now about $1.10. – Most actuarial tables for numbers of years left consider me on the very right side of the chart. That is bad. – The TV stations do not include me in that all important ‘buying’ age demographic. That is neither here nor there since I haven’t shopped much in the last 20 years. – I am lucky to have a number of younger friends. Some, due to their alternate lifestyles can go to the movies with me during the day. Some of my young pals actually ask my opinion on stuff. One young friend, in particular, goes on whirlwind cross country Zoo trips with me (and I am referred to, by her, as her ‘senior’ friend). There a bunch of very cool thirty-something friends who think it is not uncool to hang around with someone who is much older. These are all very good things. – The funny thing about aging, as all oldsters know, is that you seem to become more invisible with each passing year. I sometimes think I have gained the knowledge of the Klingon Cloaking Device because unless I am walking Benny the dog, I am totally invisible. This is a good thing because you really do not need to worry about what you wear in the street since no one is looking at you. I know, I know – they say the alternative to getting older is not desired. Very true. I share my birthday with my lovely niece, Becca and these other astrological cuspees: Ang Lee (director) , Weird Al Yankovic (comic), Dwight Yoakam (songwriter, singer) Michael Crichton (writer), Pele (Brazil’s soccer star), Charlie Foxx (singer), Diana Dors (actress) and Johnny Carson (comedian). So, I heartily accept all good wishes and hope that my Lobo ranting, raving and table pounding will keep the old noggin in great working order for some time to come. Posted by judylobo in Film Awards, This 'n That. This is a tough year. I did a lot of guessing. The Oscars could go in several directions or weighted heavily on one or two films. Oh, the excitement builds. Here are my picks. Look for my Oscar review in this space on Monday. 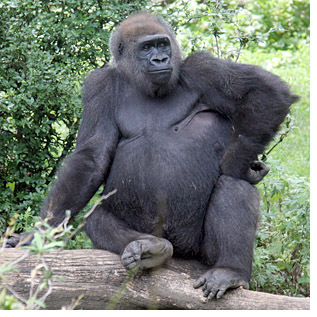 Posted by judylobo in Links, Politics, This 'n That, Videos, wildlife, Zoos. It is hard to believe, right? Just two days to go. Optimism abounds even though the country is mired in muck up to our eyeballs. Public confidence is high and that has to mean something, doesn’t it? Mr. Obama is speaking with everyone from all sides of the political spectrum bringing a much needed feel good atmosphere to a broken city. I am psyched for Tuesday and hope that you will be enjoying the Inauguration with friends, like I am. We are going to gather for a champagne brunch, lots of toasts, smiles and perhaps a few tears. Frank Rich writers about Obama coming to town. Maureen Dowd writes about Bush’ Long Goodbye. Today is filled with this and that. Oh, and a hearty happy birthday to Michelle Obama who turned 45 yesterday. – Be warned. Seat belts required wile watching this. Here is something George Bush might like to try in his retirement when not clearing brush. – Ever wonder what successful people do with each day? Check out this site. – Now that the genie is out of the bottle “Attorney General Michael Mukasey raised concerns that government agents and national security lawyers may be at risk for criminal prosecution after his likely successor, Eric Holder, declared that waterboarding of terror detainees is torture”. Mukasey said “that one reason he didn’t answer the question as Mr. Holder did was because of the peril it would pose to agents and lawyers who he believes did their best under trying circumstances following the Sept. 11, 2001 terror attacks”. – Great Moments In Presidential Speeches Compilation from Dave Letterman. It is true that I despise the man, but I have to admit, he did make me laugh at times (through the tears). – Do not sleep through the Inauguration like this little guy, okay? Posted by judylobo in Links, Photography, Politics, This 'n That, Videos. I was out standing on East 23rd Street facing east as the sun rose at 7:20 to catch the winter Manhattanhenge to take the photo above. Manhattanhenge (sometimes referred to as Manhattan Solstice) is a semi-annual occurrence in which the setting sun aligns with the east-west streets of Manhattan’s main street grid. I found out exactly when the sun would rise at this cool site. – As we inch ever closer to change in Washington, the nation, the world and perhaps the galaxy (okay – I overstated the change thing) I decided to make a few minor changes to my blog site. Drum roll please — I unveil a new masthead and subtitle. I decided ‘Fumes about our Current Administration, Art, Film and Politics’ was a bit of a stretch. I also did not want to enter this new administration thinking I would already be fuming (although I have my sites set on the very annoying Harry Reid). So check out the new header above and subtitle and you can now also see the most recent ten posts on the column on the right. – Was anyone else ‘creeped’ out by that five President meeting in the Oval Office yesterday? How uncomfortable was it all? Didn’t Jimmy Carter want to jump on the desk and scream at the top of his lungs about what has happened to our Democracy? Smudge pot needed after all of those previous creeps leave that office please. Bull Clinton spoke about the rug! – Barack Obama wants to hold onto his Blackberry. Good for the new President. He does not want to enter that bubble and lose his grasp about what we are thinking, saying and doing. “Speaking with CNBC Wednesday, Obama explained that he is still fighting to hold onto the device despite the sea of lawyers who have warned him against keeping it. He said – I’m still clinging to my BlackBerry. They’re going to pry it out of my hands… I don’t know that I’ll win, but I’m still–I’m still fighting it. And–but here’s the point I was making, I guess, is that it’s not just the flow of information. I mean, I can get somebody to print out clips for me, and I can read newspapers. What it has to do with is having mechanisms where you are interacting with people who are outside of the White House in a meaningful way. And I’ve got to look for every opportunity to do that–ways that aren’t scripted, ways that aren’t controlled, ways where, you know, people aren’t just complimenting you or standing up when you enter into a room, ways of staying grounded”. – Check out Rachel Maddow on the Daily Show last night. – Chris Matthews announced yesterday that he is NOT running for the Senate against Arlen Spector. Hardball lives. Who wouldn’t miss his sense of humor? – The Electoral College will meet today at 1 PM and formally count and announce that Barack Obama is the new President-elect. Whew! Maybe Minnesota can check in with that group too. – In the ‘you most be shitting me’ file: In the bizarro world of politics it now seems that Joe the Plumber will be going to Israel to be a war reporter for the conservative website pjtv.com. No comment. Posted by judylobo in Animal Stories, Animal Videos, Dogs and cats, Links, Photography, Politics, This 'n That, Videos, wildlife. I can always tell when the long holiday is over without looking at a calendar. I walk my dog Benny around 6 in the morning each day. My local park opens its gates at 6 and we are usually the first to enter. It has been woefully quiet these past 10 days but this morning the heartbeat of the City returned. The fruit vendor was setting up on the corner and we said our usual ‘good morning.’ The Kenyan newspaper guy is on the corner once again practicing his English and selling the Daily News and the NY Post. We exchanged our normal greeting today and added ‘ Happy New Year’ to the mix. The traffic is flowing and the people are trudging their way to work. The Daily Show, Colbert Report, Keith Olbermann and Rachel Maddow all return to normal programming tonight. Life goes one. It is a return to normal except for the following few things. – The map above gives you a good idea of the size of the Gaza strip. It is superimposed over the State of Rhode Island. I would like to give credit to this map – but I cannot remember where I found it. Mea culpa. – Aren’t we all glad that Bill Richardson’s lobbying to be Secretary of State did not work out? It would have been much worse if he had to back out of that position. Whew! – In some good news, it appears that Virginia Governor Tim Kaine will become chairman of the Democratic National Committee. He was on the short list to be VP on the Obama team. I remember seeing him on an interview and he said his moving eyebrow was a distraction to the voters. I laughed and laughed. He seems like a good choice to me. Stay tuned. – It looks like A state election board on Monday will announce Democrat Al Franken as the winner of the Minnesota Senate race, defeating Republican incumbent Norm Coleman. Secretary of State Mark Ritchie told CNN the canvassing board on Monday will confirm that Franken won the race by a 225-vote margin. I know that you are not going to miss this thug – but he has to be listened to to remind us of how much he has gotten away with all of these hellish years. He has no regrets, no remorse and apparently no soul. Watch his speak with Bob Schieffer on Face the nation yesterday. Cheney implied that a presidents actions were legal if those actions didnt result in his impeachment. – Remember Jack Abramoff? So many scandals – so confusing. Well, some people think that more Repugnant heads are going to roll in 2009. “To date, sixteen people—including Abramoff—have plead guilty in the scandal and as terms of their pleas they have been cooperating with the DOJ. Another two have been indicted. One is awaiting trial while the other was recently found guilty again in a retrial. Others, including Abramoff, have been indicted for crimes committed on the US Territory of Guam. A trial there is schedule to begin in January 2009. And then there are some indictments on the Marianas Islands that may also prove to be related to corruption in Washington when they come to trial. And that is just what is known on the surface. There are quite a few people identified in these cases who have yet to be indicted, but their day is coming.” Stay tuned. Posted by judylobo in Photography, Politics, Religion, This 'n That, Videos, wildlife, Zoos. My favorite TV station is NY1. Yes, it is egocentric since it is all about NYC and many of you do not live in this part of the world. Oh well – what can I do? Similar to 1010WINS radio, NY1 gives you all you need to know in 30 minutes. My favorite feature is called ‘What’s in the Papers’. I time my gym going to make sure I am on the treadmill at 41 past the hour (in the AM) to get a recap of what each local paper is covering, including the NY Time, the Daily News, the Post, Wall Street Journal. The Observer and Newsday. Often tongue in cheek, it is the best five minutes of TV on any given day. Now NY1 is sharing this feature on the web and you can watch the entire week’s worth of coverage. Check it out here. In case you do not know, that animal above is a tapir. – Want to feel better about your monthly statement? Check out this list of Bernie Madoff losers from The Wall Street Journal. – File this under ‘what the f**k? – Alberto “I can’t recall’ Gonzales is writing a book about his tenure as Attorney General. “What is it that I did that is so fundamentally wrong, that deserves this kind of response to my service?” he said during an interview Tuesday, offering his most extensive comments since leaving government. During a lunch meeting two blocks from the White House, where he served under his longtime friend, President George W. Bush, Mr. Gonzales said that “for some reason, I am portrayed as the one who is evil in formulating policies that people disagree with. 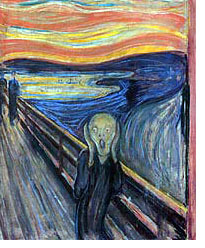 I consider myself a casualty, one of the many casualties of the war on terror.” Gasp! – 2008 Mug Shots of the Year – good grief! – Interesting photo site – Russia’s best art museum guards. In the art museums of Russia, women sit in the galleries and guard the collections. When you look at the paintings and sculptures, the presence of the women becomes an inherent part of viewing the artwork itself. – The Dangers of Being a Television News Reporter – gulp! – A subway map for words: Visuwords™ online graphical dictionary — Look up words to find their meanings and associations with other words and concepts. Produce diagrams reminiscent of a neural net. Learn how words associate. Posted by judylobo in Dogs and cats, Photography, This 'n That, Videos, wildlife, Zoos. The day before Christmas is filled with frenzy and some panic for the people who celebrate this important date. Do you have enough gifts? Will the black ice now on the ground melt? Did you send everyone a card? When will you go back on you diet? Holiday food and goodies are a killer. Why is your gym closed on Christmas Day? Will the line for the movie you want to see be huge? Should you buy your ticket in advance? Will you ever get to see all of those movies? Why do they cram them all in at the end of the year? Tomorrow will be the Second Annual Installment of Lobo’s ‘What’s a Jew to do on Christmas day?’ For today enjoy these tongue in cheek photos and a very funny video.